My apologies in advance if this post offends anyone… but my experience in the horse world AND the science world is that us horse-gals and guys have pretty much seen the worst of the worst, and so for the sake of knowledge – read on. I have always been fascinated by the sciences: biology, anatomy, chemistry, etc… which ultimately is what led me to pursue a degree in Biochemistry. Even though I no longer work in academia, my scientific brain still chirps in my ear when I am doing every day tasks; taking care of my horses, helping Dr. Marc out at the vet clinic – or better yet – laying around watching the movie Secretariat with Brandad and the little one. So picture this: Brandon completely zoned out on his phone and Ariele half-asleep; I am definitely the only one jumping out of my seat and wiping away tears at the final scene when Secretariat blazes past Sham and finishes the Belmont at a record 31 lengths ahead of the 2nd place finisher, crushing the Triple Crown like no other horse ever had and probably ever will again. I mean really?? How do you not just sob with excitement?? OK, OK… I know I am a girl and am known to have moments of extreme emotion from time to time. But still! Amazing! So after that I was thinking… how do horse’s bodies allow them to do such incredible feats? I had heard a rumor that when Secretariat’s heart was weighed at autopsy it was a mind-blowing 22lbs, whereas a “normal” Thoroughbred horse’s heart weighs about 8lbs. So that may have had something to do with it? Unfathomable. So then I was thinking about my sweet Midnite Tserenade. At almost 24 years young, she still has just about as much get up and go as she’s always had. Secretariat she is not, but the last time I opened her up to a full gallop across the pasture I still had a good few minutes of trying to catch my breath upon stopping because it’s just that exciting. HORSES ARE INCREDIBLE. Are my horse-people out there familiar with the sound horses make when they are at a full gallop? If you’re like me, you LOVE that sound. So powerful… it literally sounds like a train barreling down the tracks. AND HERE’S WHY! 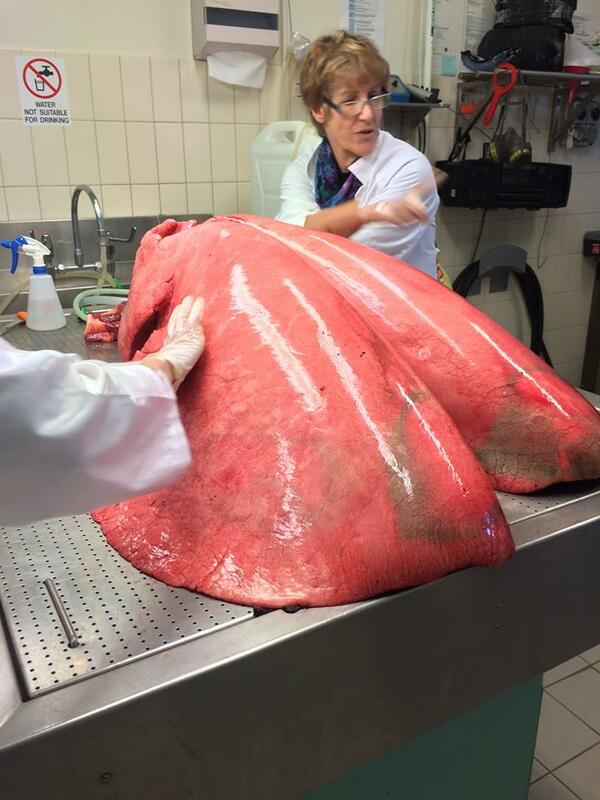 These are a “normal” old horse’s LUNGS. Look how huge they are!!! Good grief! Could you imagine what Secretariat’s looked like?? To some extent the horse is still an enigma. There is no other animal that can carry the weight of a person (often representing an extra 10-15% of its own body weight) and move at speeds of 35 mph or more. Secretariat ran at 38mph! At canter and gallop, normal horses take one breath perfectly in time with one stride. This is referred to as respiratory-locomotor coupling. The amount of air moved in and out of the lungs increases in direct proportion to how fast the horse is running. If a horse runs twice as fast, it must move twice as much air in and out. You cannot train the respiratory system of the horse. Plenty of books will tell you that you can. A number of scientific studies show the reverse. The amount of air moved in and out by an unfit horse at a fixed speed will be the same six months later when that horse is fully fit. Translation: a super horse is a super horse – they are born that way! If all the airways in the lung were opened out and laid flat on the ground, they would occupy a total area equivalent to 10 tennis courts. For your viewing pleasure – check out this video of the ACTUAL race where Secretariat claims the Triple Crown on June 9, 1973. Try not to get emotional – I dare you!